IntelliJ IDEA 2018.2 serves up MacBook Touch Bar support, Java 11 support, breakpoint intentions, Spring Boot improvements, version control enhancements, and more. Check out the awesome new features included in IntelliJ IDEA 2018.2, then download it and try them all out for yourself! CLion 2018.2 works with new project models (Gradle and compilation database), and becomes more responsive and accurate thanks an experimental complementary clangd-based language engine. This release also introduces support for Google Sanitizers and databases. GoLand 2018.2 provides support for Go modules(vgo), an enhanced Move refactoring, new quick-fixes, additions to the Postfix Completion and Intention Actions families, and an upgraded debugger. The release makes working with VCS better across the board, and incorporates many other features from the latest IntelliJ Platform release such as frontend-related updates and Touch Bar support. PyCharm 2018.2 fully supports pipenv, expands its support for pytest and pytest-bdd, makes reading quick documentation easier, and has many more improvements in store. RubyMine 2018.2 provides the ability to attach to remotely running processes with the debugger, adds chruby support, significantly improves code insight and navigation, and features extensive YAML support. WebStorm 2018.2 brings lots of powerful new features. Try the Extract React Component refactoring, find unused code thanks to the Code Coverage report, add dependencies to your Angular app using the integration with 'ng add', and run and debug apps in the IDE using Node.js on WSL. TeamCity 2018.1 brings simplified configuration via Kotlin DSL, streamlined Docker support, out-of-the-box Amazon S3 integration, and the ability to configure a read-only node for a High Availability setup. We urge you to update to the latest version as soon as possible as it includes important security fixes. Learn about the major features of this release in the What's New in TeamCity 2018.1 webinar. What have we learned about the programming world lately? In 2018, the ratio between learners and users of PHP, JS, and Java are the lowest observed: the number of people learning these programming languages is half those using them regularly. Does this mean that developers have already mastered them? 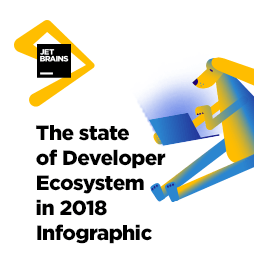 Learn more in our The State of Developer Ecosystem in 2018 report. ReSharper Ultimate 2018.1.3 and Rider 2018.1.3 — We take security vulnerabilities seriously. These updates deliver the hotfix for the Zip Slip vulnerability, which was found in several third-party tools used both by ReSharper Ultimate and Rider. Kotlin 1.2.50 — A new Kotlin bug fix and tooling update is available. Learn more about the release. Kotlin/Native v0.8 — This update offers safer concurrent programming, extending the stdlib functionality, and better iOS development support. Rider Gets Unit Test Coverage and Continuous Testing — With each Rider release, we do our best to bridge the gap between Rider and the ReSharper Ultimate bundle. The most requested feature has certainly been "Rider + dotCover" integration. The latest 2018.2 EAP build is the first Rider version ever that features unit test code coverage and support for continuous testing (on Windows). Introducing YouTrack App for Slack — We are happy to introduce the YouTrack App for Slack. Have a look at the features that are supported in the current version. YouTrack 2018 Q1/Q2 Roadmap Retrospective — In January, we published a Roadmap for Q1 and Q2 2018. Here's a look back at what we managed to deliver in the past six months and a little insight into our plans for features that didn't quite make it out the door. YouTrack 2018 Q3/Q4 Roadmap — We are pleased to share our plans for YouTrack development in the second half of 2018: per-project privacy settings for custom fields, Jenkins integration, custom localization improvements, and more. ISO C++ Committee, Rapperswil 2018 Trip Report — June 4th through 9th, Phil Nash and Timur Doumler attended the ISO C++ Committee meeting in Rapperswil, Switzerland, representing JetBrains. Their report covers what's coming to C++20 as a result of the meeting as well as the direction of the committee. Java Annotated Monthly: July — This month's edition offers a wide selection of reading including lengthy sections on Community and Culture, since it's not always about lines of code. Using BigQuery from IntelliJ-Based IDEs — Continuing our series on how to connect DataGrip (or any other IntelliJ-based IDE) to various data sources, this post shows you how to connect to Google's BigQuery, a low-cost enterprise data warehouse designed to handle data analytics at a massive scale. Sharpen Your Sense of (Code) Smell — This post is part of a 10-week series by Dino Esposito around a common theme: code smells and code structure. Clangd as an Additional C++ Language Engine — CLion 2018.2 introduced a clangd-based C++ language engine that complements CLion's own language engine. This is an experimental solution that is used for showing code errors and warnings in the CLion editor. Unity Explorer and New Code Inspections in Rider 2018.1 — You might remember our prior posts about the new features in Rider 2018.1 that integrate directly with the Unity editor. This post looks at the new Unity Explorer to see what's new for code analysis. C# 7.3 in Rider and ReSharper 2018.2 EAPs — C# 7.3 was officially released, adding several new features that can help us write cleaner, clearer and more concise code. Look at some of the new C# 7.3 language features and find out how ReSharper and Rider 2018.2 EAPs support them. Debugger Improvements in Rider 2018.2 EAP — More meaningful call stacks, thread-specific breakpoints, and other debugger improvements await you in Rider 2018.2 EAP. Solution Explorer and Project Model Updates in Rider 2018.2 EAP — Let us introduce you to the newest changes around the solution explorer and project model. C++/CLI Support in ReSharper C ++ 2018.2 EAP — The worlds of C++ and C# are bridged by the interop language, C++/CLI. ReSharper C++ 2018.2 EAP now provides initial support with some limitations. ReSharper Ultimate 2018.2 EAP is here! Try partial C# 7.3 support, out-of-the-box ReSpeller, initial Blazor support, initial C++/CLI implementation, improved C++17 support, and the first C++20 features. Rider 2018.2 EAP kicks off! Preview improved Unity support, new scoring engine in code completion, redesigned Solution Explorer, partial C# 7.3 support, initial Blazor support, and lots more!